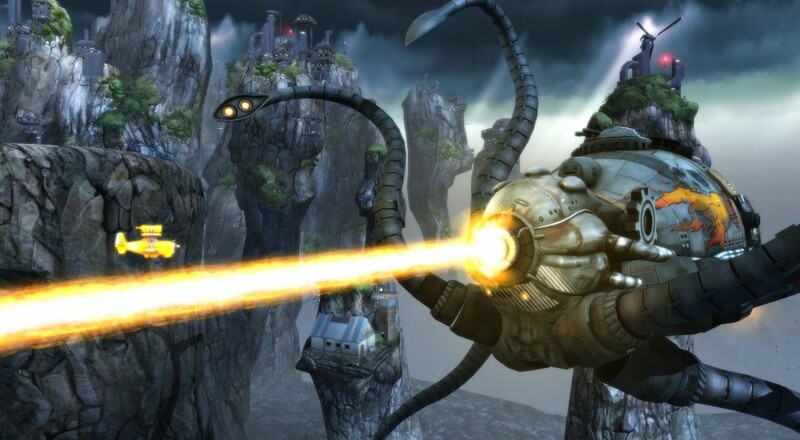 Grasshopper Manufacture's 2012 shmup, Sine Mora, will see a re-release this year as Sine Mora EX. The game will be coming to PlayStation 4, Xbox One, PC, and Nintendo Switch touting some revamped visuals and a new 16:9 aspect ratio (and 4K support for PC/PlayStation 4). Perhaps the best new feature, though, is the local co-op. If you're familiar with some of Grasshopper's (and Suda 51's) past games, then you know they have some interesting takes on familiar video game formulas while also weaving a different kind of story. Sine Mora is no exception to that as the main narrative revolves around two different tales occurring at two different points in time, but they're linked in a rather interesting way. From a gameplay perspective, rather than the player's ship having a health bar or dying in one hit, each time you take fire from an enemy, you lose time. Like I said, there's a lot of interesting stuff going on here. The good news is that you can team up with a buddy locally to play through the entire story. Sine Mora EX will arrive sometime this summer for the PC, PlayStation 4, Xbox One, and Nintendo Switch. It will feature two player local co-op throughout the story mode on all platforms, and should retail for $19.99.